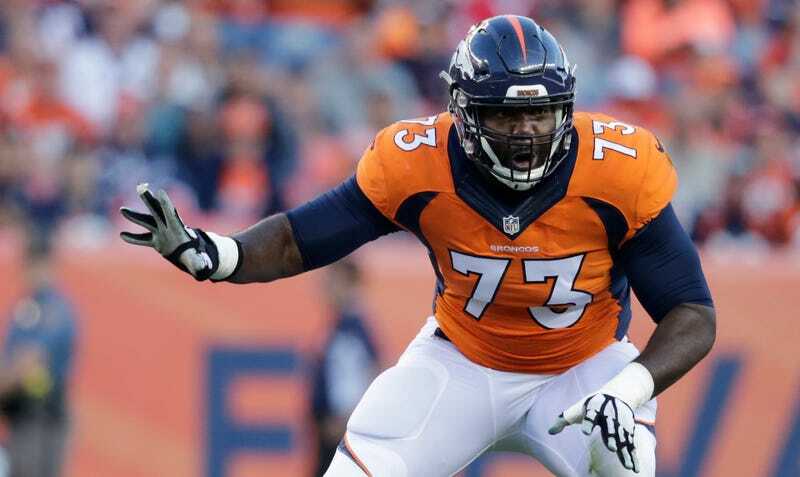 Offensive tackle Russell Okung, who signed with the Broncos last offseason, is now a free agent. This is unsurprising, because despite the fact that Okung had a five-year “contract” with the Broncos that was “worth” $53 million, the Broncos faced no financial penalties for cutting him. You might remember that Okung negotiated his contract with the Broncos on his own, and that the most charitable way to describe the deal he came away with was “extremely ill-advised.” Okung’s contract came with no guaranteed money, and was essentially a one-year deal with a single option for the next four. Okung made just $8 million by staying on the team and hitting incentive markers last year, and the Broncos went into this offseason with the ability to pick up his option, which would have guaranteed him another $20.5 million. Okung played in 16 games for the Broncos and didn’t have a great year, which contributed to the team’s overall offensive struggles. Even if he had played better, it was always unlikely that the Broncos were going to pick up his option. He may have thought that he was “betting on himself” when he negotiated a heavily backloaded and un-guaranteed contract, but all he was really doing was giving the Broncos a chance to squeeze one year of service out of a former top-10 pick at a discount rate. Now he’s back on the free-agent market, older and less valuable than he was at this time last year.